With our mobile device interface, athletes find events, get pictures and results, and make donations to their favorite charity. With our powerful search tools, athletes locate your event by browsing or entering the event name. They can register for your event right from their mobile phone...they really dig this! 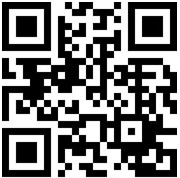 Scan the QR Code at right and see how easily donations can be made on mobile devices. We all know how pictures on social media sites is all the rage. With our mobile device interface, runners quickly retrieve their pictures and upload them to sites like FaceBook and Twitter. Let's face it, runners want results fast on their mobile device. Our mobile device interface allows runners to quickly lookup their results by name or bib number. With the explosion of mobile devices, athletes want access to resources on their phones. Our mobile interface gives them what they need, when they want it.